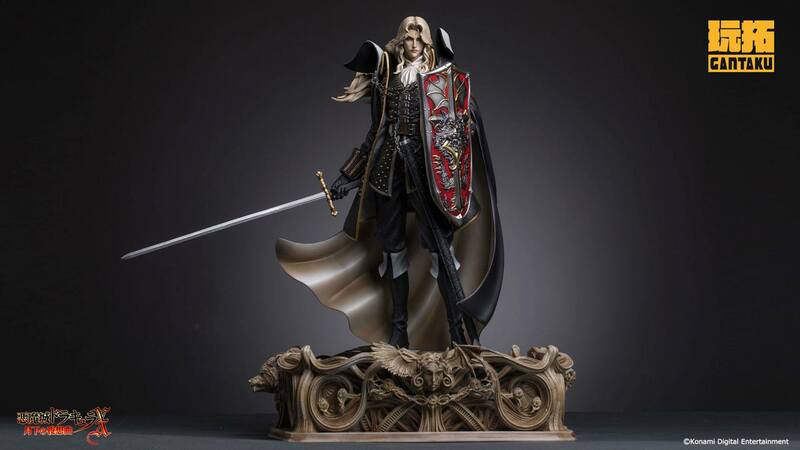 The collection statue of Alucard is designed and developed by GANTAKU authorized by Konami. They can commemorate the good time in our youth that "spent" in the game. They pour the full effort and energy into making repeated revisions and perfect adjustments. striving for restoring the cool face of a vampire noble man in the game and better interpreting the unique style of the famous Japanese illustrator Kojima Seimei. The classic architectural styles in the background of game story are reproduced to the maximum degree. including the detail expression in each fine carving. the gorgeous costumes of noble Alucard and the subtle molding of base scenes. They are not only devoted to the shape carving of Alucard. but also focus on the details. including his weapons and base molding. A noble man of half-man and half-vampire with the bat and wolf head on his left and right sides are expressed by the base which condenses one of background information of this game.